Instagrand (photo by Ernie Belmonte). A year ago, the racing world witnessed eventual Triple Crown winner Justify, who at the time was unraced as a 2-year-old with just two starts under his belt as a sophomore, make his stakes debut in the Santa Anita Derby (GI) and stamp himself as the runner to beat in the Kentucky Derby (GI) with his easy wire-to-wire score by three lengths. The victory immediately earned the flashy chestnut a spot in the gate under the Twin Spires four weeks later and, as well all know, he’d eventually go on to earn racing immortality and retire after the Belmont Stakes (GI) in June. So, while there’s no Justify in this year’s 83rd edition of California’s major prep for the Run for the Roses, a solid field of six will line up and race the nine furlongs over the Santa Anita main track. The race is one of the final to offer points on the Road to the Derby on a scale of 100-40-20-10 to the top-four finishers. The day’s main event, which has been carded as Saturday’s eighth race, will go off at 4:14 p.m. PT. This year, the local weather calls for dry conditions and warm temperatures reaching to near 70 under partly cloudy skies. In 2014, two-time Horse of the Year California Chrome won Santa Anita’s top prep before wearing the garland of roses in Louisville and, in 2012, I’ll Have Another also won, joining the list of past winners that is made up of nothing but Hall of Famers — A.P. Indy, Sunday Silence, Winning Colors, Affirmed, Majestic Prince and Swaps. Other names to have started or won include Pioneerof the Nile, Point Given and Free House, as well as off-the-board runners Silver Charm, Giacomo and many more. Exaggerator romped to a 6 ¼-length victory in the slop three years ago before finishing second in the Derby and capturing the Preakness Stakes (GI) and, two years ago, the race would be the last career win for the now-retired Gormley. Not surprisingly, Hall of Famer Bob Baffert has saddled a record eight winners, including Justify last year and Dortmund (2015), Midnight Interlude (2011), Pioneerof the Nile (2009), Point Given (2001), General Challenge (1999), Indian Charlie (1998) and Cavonnier (1996). The recently retired Hall of Famer Gary Stevens has booted home a record nine winners — Winning Colors (1988), Mister Frisky (1990), Personal Hope (1993), Brocco (1994), Larry the Legend (1995), Indian Charlie (1998), General Challenge (1999), Point Given (2001) and Buddy Gil (2003). Three horses share the fastest time of 1:47 — Lucky Debonair (1965), Sham (1973) and Indian Charlie (1998). Roadster (5/2) – This $625,000 son of Quality Road has spent most of his career in the shadow of his champion stablemate (and rival today) Game Winner, but he’s only really been tested once in three starts, finishing a game third in Del Mar Futurity (GI) last summer. 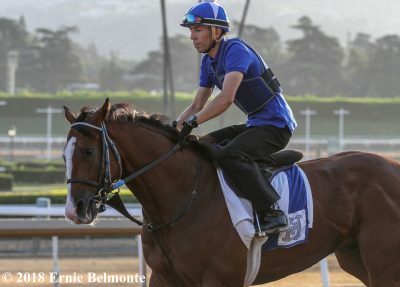 Bob Baffert has always been high on this colt despite a barn full of talent and though the rail isn’t ideal, he is in good hands with Justify’s jockey, Mike Smith, who also rode Tiago to victory in 2007. More Ice (30/1) – Hall of Famer Jerry Hollendorfer, who hasn’t ever won a Santa Anita Derby, rolls the dice with this $52,000 stakes-placed son of More Than Ready. He is consistent, but has never faced the kind he’ll face in this field, and has done his best racing on turf and all-weather tracks. Giovanni Franco makes his Santa Anita Derby debut. Nolo Contesto (6/1) – Trainer John Sadler tightened the girth on Sidneys’ Candy for the win here in 2010 and has had a pretty good year for the last 12 months, though he’s always been a top stakes-winning trainer. This colt is a son of the recently deceased Santa Anita Derby winner Pioneerof the Nile, so a win would be poetic. But, unfortunately, he’s getting quite the acid test in his stakes debut. Joe Talamo, who was aboard Sidney’s Candy, rides this colt. Synthesis (30/1) – Makes his first start for new trainer George Papaprodromou in an awfully ambitious spot. Though he was third in last summer’s Best Pal Stakes (GIII), his only other two forays into graded company produced well-beaten finishes. This $16,000 son of First Samurai has a promising future, but maybe not starting here. Rafael Bejarano rides in search of his first Santa Anita Derby win. Instagrand (3/1) – At one point before the Triple Crown trail heated up, this $1.2 million son of Into Mischief was the clear division leader with his two first career starts producing 10-length victories, including in the Best Pal Stakes (GII), before his owner, Larry Best, elected to skip the Breeders’ Cup and give him time to grow up. His sophomore debut was a decent third in the Gotham Stakes (GIII) and he’s back at home in California for this race, with new rider Flavien Prat aboard. Game Winner (4/5) – Last year’s Breeders’ Cup Juvenile (GI) winner and Champion 2-Year-Old returns off a nose defeat to Rebel Stakes (GII) winner Omaha Beach after the Gary and Mary West-owned son of Candy Ride was forced to audible, skipping the San Felipe Stakes (GII), which was cancelled when Santa Anita called off racing due to track conditions for three weeks. Now back training regularly, he is the one to beat. 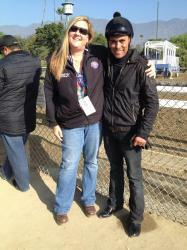 Regular rider Joel Rosario is back in town for the mount. 2018 Kentucky Derby Road: Which Horses will Shine?